If you are lucky you had a high school teacher who touched your life in some major way that made a difference in who you became. I certainly did. He was Lynn Tewksbury who I learned this morning passed away a week shy of his 85th birthday. He was my wrestling coach and line coach for football. High school sports for me was a transformative experience. It allowed an uncommonly shy boy to gain confidence and demonstrate some well hidden leadership potential. Coach Tewksbury not only provided the opportunity for me to grow he was the reason I grew. 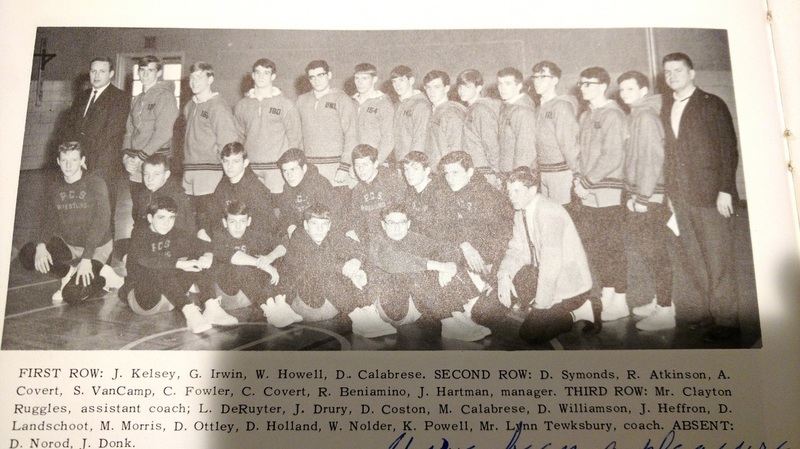 Coach Tewksbury was my gym teacher when I moved to Phelps in January of 1961. I remember one of my first 6th grade gym classes in Phelps. You can guess what unit coach was teaching... wrestling. I was a Long Island suburban kid lost on the farm. I knew virtually nothing about wrestling and was grateful to fellow student Gary Carroll for showing me the basics so I didn’t look completely stupid. It was obvious to coach Tewksbury how little I knew but when he showed us how to do a switch and with Gary’s help I actually did it. Coach commented, “You’re a fast learner.” A kid who was too shy to go out for little league baseball and had never shown any propensity for sports had just received a compliment for something physical. It was a great feeling. To be honest wrestling was not my first choice of winter sports. My first upstate New York winter I put a rim up in my barn and shot baskets all winter long. I fell in love with basketball and finally got the nerve to go out for 8th grade basketball team. Science teacher Mr. Silver was the coach and he broke my heart when I was one of the last players cut. I heard years later that Coach Tewksbury told Mr.Silver that I would never be much of a basketball player and that I should be a wrestler. Mr. Silver made sure that happened. It was a smart move considering I never got over 5’9”. Thanks to pressure from sister Esther’s male classmates (Class of ‘64) I went out for football my freshman year. I can’t say I loved it at first. It was more like I was terrified of it. Slowly, as I gained more skill I gained confidence. As I gained confidence I started having fun. I’ve long felt that self-esteem and confidence comes from doing something well. Coach Tewksbury helped me learn to do something pretty well. I was never a natural athlete but I had a good work ethic and once I had a little taste of success I wanted more of it. Football season turned to wrestling season and it just seemed to make sense to go out for wrestling. I remember coach’s wrastle route. I can’t remember how long it was but it seemed like forever and we ran it every day before practice.Once a week we had to do a timed run. If we didn’t beat our previous timed run we had to run it again. No one wanted to run it again. I didn’t and I never did. What do I remember about Coach Tewksbury. He was tough but fair. I don’t remember him being a yeller. Perhaps he raised his voice but I don’t remember it. I remember he was a terrific role model. He walked the talk. He was the kind of guy that you didn’t want to let down. You wanted to do your best. I also remember he had a good sense of humor. He wasn’t afraid to have fun with us. In both football and wrestling I remember having fun. In particular I remember playing games of euchre in the back of the bus on our way to far away tournaments. I’ve probably gone on too long and too much about me rather than coach Tewksbury but let me wrap up with a few last thoughts. We had a heck of a team our senior year. Best senior wrestlers on our team hands down; Lee Deruyter and Billy Nolder. Dave Williamson, who I had to wrestle off with each week, was the strongest. Lee at about 5’ 10” tall and weighing in at about 135 provided the definition of lanky. He was sectional champ! I remember Billy as being small at 100 lbs and tough as nails. Those two were guaranteed points during our matches. Dave and I competed every week. Over the year I was incredibly lucky to win my share of wrestle offs with him but I dreaded our matches. Dave frequently had to wrestle above his weight and usually brought us more points. My hats off to these guys and the rest of my wrestling teammates! Lastly I share what coach Tewksbury wrote in my yearbook. Some will remember that he had great handwriting and would write with a ruler. “You’ve been a pleasure to work with, may every chance for success and happiness come your way.” With much thanks going to you coach I’ve been fortunate to have my had my share of success and happiness. Wilderness Education Association Instructor Francois Guilleux teaches the SPEC approach to teaching and learning in Japan! I just learned of Tap Tapley’s passing. Tap worked with my mentor Paul Petzoldt at the first Outward Bound School in Colorado and helped Paul establish the National Outdoor Leadership School in the early 1960s. I had the honor, as president of the Wilderness Education Association, of presenting Tap with the first Paul Petzoldt Award. It was 1988 and I remember him telling the story of how he “invented” the Outward Bound “solo” when a mudslide blocked the road to the Marble Base Camp and they couldn’t get any food delivered. It was an incredibly creative way to solve a practical problem and went on to become an integral part of the Outward Bound experience. I first met Tap when he co-led the first NOLS expedition up Mt. McKinley (Denali) in 1971 along with Ken Clanton. I found him to be a skilled and compassionate leader who was an incredible role model. The nearly 40 day expedition up the Muldrow Glacier route had all the challenges a leader would want and then some. Bad weather, air-drop snafus, and a fatal accident were enough to challenge any leader but Tap handled the issues as well and anyone could. I saw Tap once or twice since 1988 at WEA gatherings of one sort or another. He was always the picture of health and looked as if he was living a healthy life. Tap Tapley was a very special person. Not just because he, like Paul, was a wilderness education pioneer but because he was a hell of nice guy who helped me learn a lot about the outdoors and leadership. Read more about Tap HERE. I got the following email recently. I am sharing it in the hopes that those of you who's life were influenced by Paul will consider donating to this great celebration of his life. "As you probably know, 2015 is NOLS’ 50th Anniversary! A small group of early grads thought that this would be a great time to immortalize Paul. We approached NOLS and they have agreed to allow us to raise the funds and to place a life size, bronze statue of Paul in the courtyard of the NOLS headquarters. We need to raise $85,000 to pay for the artwork, the statue, and installation. We’ve already raised $5500 of the $85,000 required. We’re writing to ask you to help us do two things: to make a donation to the Paul Petzoldt Memorial and to help us identify others who might join us in this effort to celebrate Paul’s life and achievements. We want to have the statue unveiled at NOLS 50th Anniversary Celebration on October 8th, 2015, so time is very short. To help reach the goal quickly, we have 60 autographed copies of “Teton Tales” to give to the first 60 donors of $1000 or more --- and 56 copies remain! Donors of $10,000 or more will be given a 12” Bronze maquette of the statue. Donations should be made to the Paul Petzoldt Memorial Statue at NOLS. Donations can be made by mail or online. Be sure and designate the money is to go to the Paul Petzoldt Memorial Statue fund. These are tax-deductible donations to NOLS so there will be no refunds; any funds not used for the statue will be used for NOLS scholarships. Please make your donation as soon as possible … we will need to make a series of payments for the artwork and manufacture of the Bronze Statue. We are excited about this project and hope you are too. It’s time Paul was visibly recognized in Lander. We’ve included our email addresses below if you have any questions or want to contact any of us for any reason. The 50th Anniversary Celebration is October 8, 9 &10, 2015, we hope to see many of you there. Look forward to hearing from some of you." 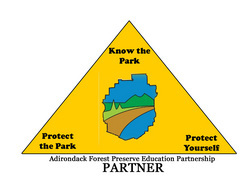 The North Country Economic Development Council recently announced that Hamilton County has been awarded a $220,000 matching grant to develop an Adirondack Park-wide Community-Based Trails and Lodging System plan which includes: a GIS database of existing trails, lodging and related recreation infrastructure; recommendations for new trails and lodging opportunities; and construction of small community-based recreation infrastructure projects. Jack Drury, co-owner of Leading E.D.G.E., who will be spearheading the effort stated, "Special thanks to Caroline Hotaling for assisting us in writing the grant and Hamilton County Chairman of the Board of Supervisors Bill Farber for his confidence in Joe Dadey and me and our vision. We look forward to hitting the ground running." To learn more visit the ACTLS page HERE. So You Really Want Change in the Classroom? Many years ago while working with schools in Scotland I remember my colleague Bruce Bonney pondering the question, "What does it take to implement change in the classroom?" Groups of students - Students need to work in teams if we are going to replicate the 21st Century workplace. Extended blocks of time - It is extremely difficult (although not impossible) to create meaning lessons in 45 minute blocks of time. Visionary skilled leadership - Teachers can't take risks and try new things without administrative support. Clearly articulated outcomes - What do you want both teachers and students to know and do? Appropriate support - Teachers and students both need the resources to do the job. It may range from professional development to time to financial support. A sense of urgency - All stakeholders need to see the importance of the need for change and a desire to have it occur as soon as possible. I have done a lot of coaching in my time. Whether its at the YMCA with 10 year old girls playing basketball, negotiating the route of a map & compass “bushwack” to a wilderness mountain peak with high schoolers, or scribbling debriefing notes on an interactive whiteboard as I consult with teachers at a conference, understanding what is “developmentally appropriate” for my audience in each of these settings is part of the challenge of being effective. Typically, I’ve heard the phrase “developmentally appropriate “ when discussing teaching strategies for very young elementary kids. However as the years progress, I have come to realize that dealing with this issue is always a consideration no matter what the context . Adjusting my teaching approach to “fit” the skill set and knowledge base of the audience is just as important with adult educators in a workshop as it is with 4th & 5th graders on the basketball court. Recently I had the experience of working with a group of relatively inexperienced teachers. As my work with them progressed, it was clear they had lots of ideas about what they wanted in their classrooms, but few “nuts and bolts” strategies to actually make these things happen on a daily basis. In short, they had a vision of what they wanted for their learners, but lacked the professional repertoire to build and maintain a classroom structure that would support their dream. This was especially the case when it came to thinking about what they would/could do to create a classroom culture that would support the kind of small group, problem-based learning experiences they wanted to provide for their students. As I worked with them further I slowly recognized the connection between the basketball court and the classroom. Much like my 10 year old basketball players on the first day of practice, these teachers needed a coaching approach that was developmentally appropriate to the level of their repertoire… essentially that of “rookies”. And so, I applied the same principles in working with the teachers regarding the development of their classroom culture as I use each season on the basketball court with kids new to the game. I model behavior that will raise their odds of achieving success. I demonstrate “fundamentals” that I know will work. I model behavior that they can mimic. What I do must be something they can do… and then “drill” on their own. I model behavior that is detailed, specific, and achievable and show them how to practice it. Beginners need to have a mental “checklist” for a quality performance to know if they are doing it “right.” They want to know (or an informed observer/friend/colleague who is willing to help) what to “look for/listen for” as they practice. I accompany the modeling with verbal imagery, catchy phrases, or descriptive labels that will help them recall what they need to do when they are practicing. I sometimes refer to these as “triggers” or “teaching points.” These phrases or images help remind them of the important set of behaviors they want to implement. Our Basic Assumption: All groups that stay together very long develop a kind of “culture”, i.e., a complex set of personal and group behaviors shaped by common expectation, habit, ritual, and tradition that determines how the group members interact with each other. In our experience a “culture” founded upon the values of mutual respect and trust holds the greatest potential for powerful learning, productive collaboration, and successful complex problem-solving. We, therefore, want the culture of ANY collaborative learning environment to be the product of a thoughtful design and process that consistently yields the results we desire. We also recognize that any group that is newly formed is DEPENDENT upon some source of leadership to get the group started toward the realization of its objectives. We use the approaches suggested below to guide our work as Teacher/Leader/Facilitator in ALL our workshops, presentations, facilitated meetings, or classroom settings whenever we ask the participants to work and learn together productively. What do we want? We want a learning environment/classroom experience that develops and nurtures the participants’/students’ capacity to work and learn together productively both in school and in life beyond the classroom. What are some key attributes of such a problem-solving/learning environment or experience? It is safe – Participants/students feel emotionally and physically safe to take the risks that attends authentic learning, deep reflection, and the giving and receiving of open and honest feedback. It is challenging - Participants/students are constantly encouraged to tap into, explore, and expand their repertoire of academic and life-long skills to solve engaging problems and receive feedback on the same. It is purposeful – Participants/students address problems-to-solve (“challenges”) that engage them on all levels (intellectual, social, emotional, physical, etc). These challenges are designed to solve real problems or achieve specific academic objectives, and develop critical skills. Criteria for successfully achieving the objectives are clearly articulated “up front”. It is flexibly responsive – Participants/students experience frequent opportunities to make choices, explore alternative ideas, express themselves creatively, exercise their judgment, and have fun. What are some common principles & practices we use to achieve this kind of learning/problem solving environment? Teacher/Facilitator Practice: We allow for some individual choice of roles within the group, products, or performances to demonstrate learning & skill. We negotiate some of the criteria for success. We differentiate some elements of the task or modes of instruction in consideration of individual group/individual strengths and weaknesses. We set criteria for quality of both the product and process. We consistently reflect on the quality of the performance in light of the criteria. What sequence of activities or practices do we put in place to begin the process of building a collaborative learning environment? Challenge groups/teams to “produce/perform” something that is evidence of their learning and/or skill. Set criteria for the quality of the product/performance and clarify other parameters of the work (Time frame, materials, other resources, etc.). In time – Create a Full Value Contract with the group to serve as a living “Constitution” or social contract that guides individual and group behavior. Use this Full Value Contract as the reference point for dealing with issues that arise. Don't set yourself up for Failure! Day 4 at the SCEWL 2014 Constructivist Conference was busy with a couple of hours of finishing up work on projects, preparing for both the Critical Friends process and showcase presentations. The showcase presentations were unique. Instead of setting up displays and having institute participants roam around and see each display as they do at the ILCE Constructivist Conference, the showcase here was a series of three minute presentations to all the participants at once. Most groups used Google Presentations or Prezi. It was great to get a three minute presentation for each project but I doubt it would be practical if you had as many teams as the New York conference has. We had a group photo of all the conference attendees with our conference T-shirts on which was an event in itself. Tim Bedley videoed short segments of attendees sharing their observations of the week. After critical friends the attendees were asked to complete an online assessment of the conference and that wrapped up the week. Because the assessments were done digitally we were able to see the results almost immediately. Tim provided a brief synopsis of the feedback which went nicely with our PMI debrief of the conference. There was no doubt that the conference was a huge success. The feedback was overwhelmingly positive. Although all the facilitators and support staff felt extremely pleased with the results of the week our debrief shared lots of ideas of how to make the conference even better. Congratulations to Barbara Hale, Tim Bedley and all the people that made the conference possible. I know the New York folks would be extremely proud of this event. Are you getting ready for the school year and looking for some ideas for Project-Based Learning? One of the most important considerations as you prepare for Project-Based Learning is to have a plan for creating the right "culture" for these projects. Have you created a classroom "contract?" What are the routines and rituals that provide the framework for successful projects?